SAN FRANCISCO (Reuters) - The Toronto Stock Exchange's S&P/TSX fell 83.03 points, or 0.54 percent, to 15,274.44 points. Leading the index were Enerflex Ltd , up 10.1 percent, Bombardier Inc , up 10 percent, and Exchange Income Corp , higher by 7 percent. Lagging shares were Sierra Wireless Inc , down 18.0 percent, Kinaxis Inc, down 16.5 percent, and Paramount Resources Ltd, lower by 12.9 percent. On the TSX, 87 issues rose and 155 fell as a 0.6-to-1 ratio favored decliners. There were 6 new highs and 28 new lows, with total volume of 284.7 million shares. The most heavily traded shares by volume were Aurora Cannabis Inc , Bombardier Inc and Enbridge Inc. 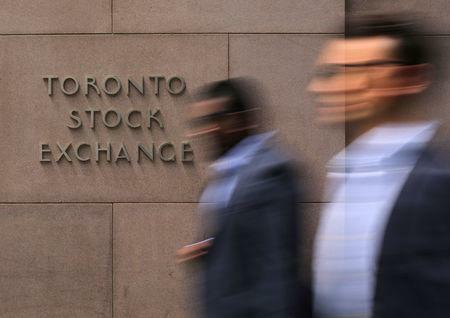 The TSX's energy group fell 2.80 points, or 1.67 percent, while the financials sector slipped 0.41 points, or 0.14 percent. The TSX is off 5.8 percent for the year.